Discover Phoenix apartments designed around the way you live. We offer a selection of thoughtfully appointed apartment floor plans designed to compliment your life. Our community and apartments offer amenities often seen in apartments much more expensive. Our communities represent the greatest rental value and highest levels of customer service and maintenance free living. 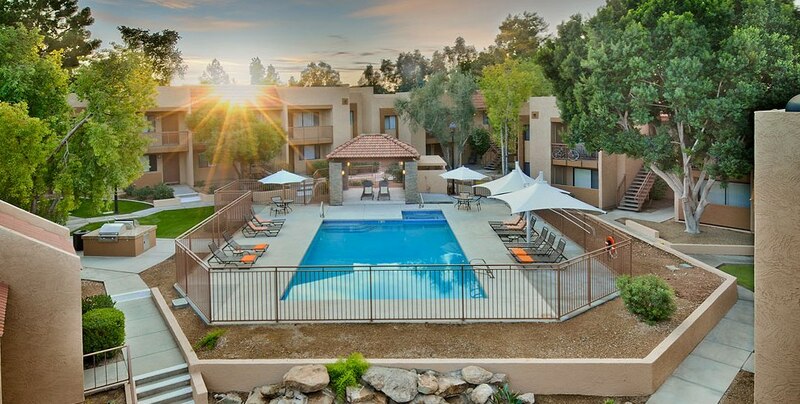 Enjoy a sparkling pool, two spas, a 24-hour fitness center and a convenient Phoenix location. Choose from a variety of spacious studio, one and two bedroom apartments with great lease specials. Trying to find Phoenix apartments that suit you and your busy lifestyle doesn’t have to be a chore. You’ll notice from the moment you first visit our apartment community that not all Phoenix rentals are the same. Enjoy the secluded park like setting of our community courtyard shaded by mature trees. Relax under the large structural umbrellas by our gorgeous pool. Enjoy a relaxing soak in one of our two spas. We are conveniently located near Papago Park Golf Course, Arizona State and a number of Phoenix Arizona’s best employers. Whether it’s work or play, you’ll find that our apartments are conveniently located at the center of it all! We are confident you’ll agree that our apartments represent one of the greatest rent values around. End your apartment search today! Schedule a community tour with one of our professional on-site leasing agents and see what real service is like. While you are visiting, make sure to ask about our current manager’s lease special. © 2009 Pinnacle Holdings, Inc. All Rights Reserved.